Tough baling conditions mean farmers and contractors should follow on-pack colour-coding to switch to stronger, higher performing twine for maximum output, advises manufacturer Tama. Choosing the right twine is easier thanks to the colour-coded segment range found on new-generation twine from Tama and most major baler makers – including Case IH, John Deere, Massey Ferguson, Fendt and New Holland. The colour segment range helps users match twine to baler type, crop and, most importantly, baling conditions, with blue suiting the least demanding conditions, through green, orange and red to brown for the most extreme. “UK farmers and contractors typically use twine with a performance and strength found in the orange segment for baling straw, so simply stepping up to red is the key to achieve expected bale weights when straw is extremely dry and brittle. If you’ve been using red segment twine, look at moving to brown,” he advises. “This year has shown what we mean by ‘extreme’ conditions. The colour segment scale shows very clearly how easy it is to move ‘up the scale’ to choose a twine of higher performance than normally used – which is shown on all the twine packaging and is followed by almost all the OEMs on their branded packaging,” says Mr Robson. The new generation twines launched two years ago use new materials and manufacturing processes to produce twine with far greater knotting performance and also achieve much longer spools, able to produce better knots at lower cost per bale. Segmented according to conditions of use, they are easily matched to specific baling situations, with a ‘rainbow’ icon on packs showing the chosen option, just like the eco-ratings on kitchen appliances. The ratings reflect in-field testing and validation by baler OEMs, in all types of crops and baling conditions around the world, Mr Robson stresses. German firm Rasspe, which make knotting systems for numerous OEM branded balers, has also approved the new colour-coded twines and employs the twine in their knotter set-up procedure during production. Tama’s orange segment twine, branded LSB Power, gives a guaranteed 2-spool pack length of 2600m, and is the most popular and best performing twine for all crops and balers where high density is required in normal conditions. For more demanding situations red-coded HD Extra is specially designed for extreme conditions, such as high temperatures and low humidity, and for ‘extra’ high density balers, such as AGCO XD and Krone HDP 1 balers operating in normal conditions. 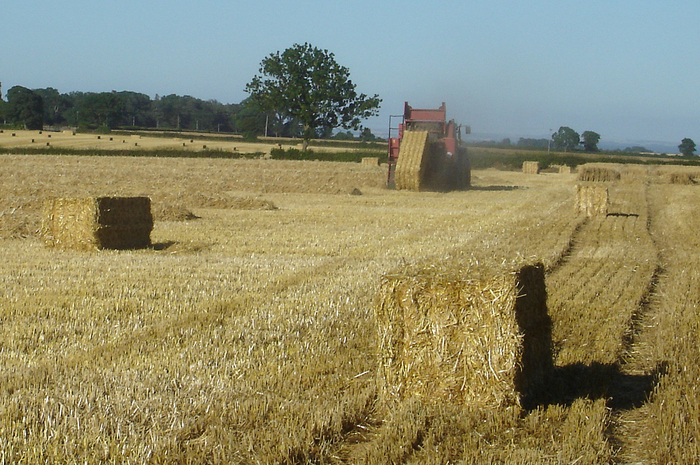 For the highest density balers working with straw in conditions of extreme density or high temperatures, short straw, or maize stalks, there is brown segment twine, not generally required in UK conditions, but it could be relevant this season. Choose longer spools to boost baling output. Take an NH 1290 baler making 8ft long straw bales, for example, with 32 spools on-board. Using so-called 7200 twine will make 930 bales, assuming the packs are actually 7,200ft. By comparison green-coded Tama Big Spool Type 72, with a guaranteed 9,600ft per pack, will produce 1,240 bales. That’s an extra 310 bales produced before re-loading, equivalent to approximately five hours more baling, assuming one bale/minute. Over a 20,000 bale season the extra twine on each spool could mean an entire pallet load less needs ordering.